E-mail your comments to me. I need something to do while I'm eating my Quisp! 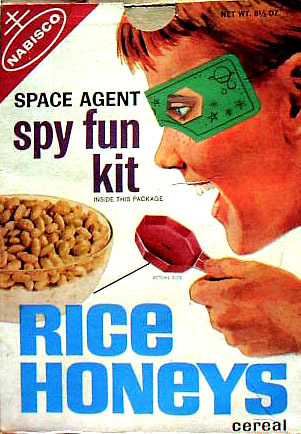 These breakfast cereals ceased to exist during my lifetime. I couldn't find a picture of Post® Corn Flakes w/Dried Strawberries! 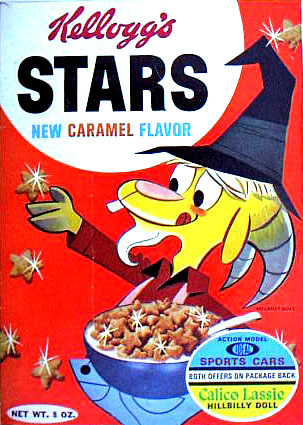 "The one and only cereal that comes in the shape of animals!" 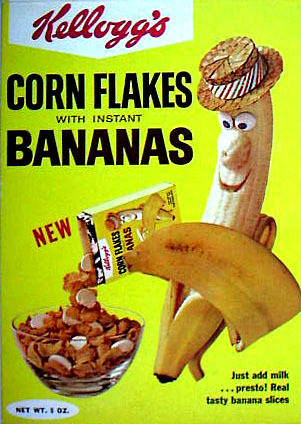 Post had some really classy cereal characters in the 1960s. There was Sugar Bear (Sugar Crisp), So Hi (Rice Krinkles), Loveable Truly (Alpha-Bits), Rory Racoon (Toasties), and a few more. 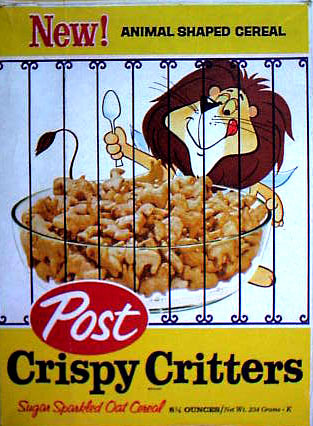 Linus the Lionhearted (who is pictured on this box of Crispy Critters) had a Saturday morning cartoon with all the other Post characters on CBS in the late 1960s. I always thought it would be funny if someone snuck in a Kellogg's Froot Loops commercial on one of the shows! 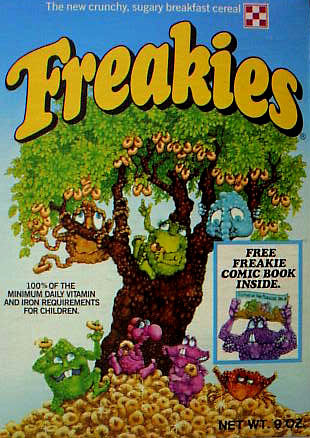 I was a little beyond kiddy cereal when this stuff came out and I still had no thoughts of having my own family. 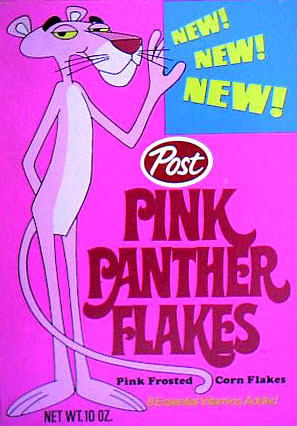 Pink flakes? NO! Pink milk? YES! 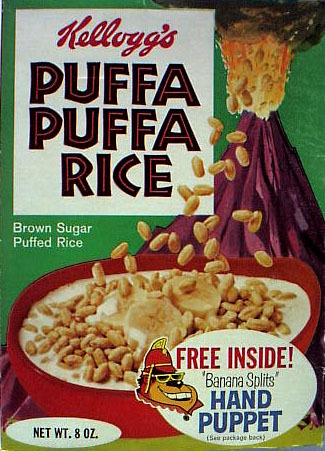 You can still buy sweetened rice puffs; that isn't the point here. In the mid 1990s the Nabisco cereal lines (owned by R.J. Reynolds Tobacco) were sold to Kraft Foods/Post (owned by Philip Morris Tobacco). 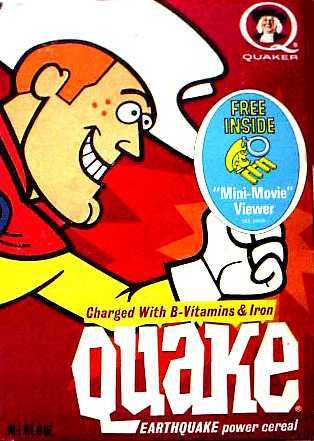 Gone were such cereals as one of my favorites, Nabisco Team Flakes. This picture was previously missing. 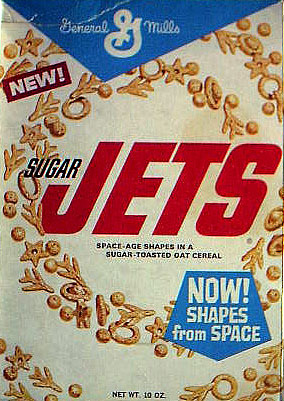 Can anyone guess why they were called Sugar Jets? Wasn't there a little bit of a hillbilly fad in the 1960s, thanks to the Beverly Hillbillies TV series? And what ever happened to the Ideal Toy Company? 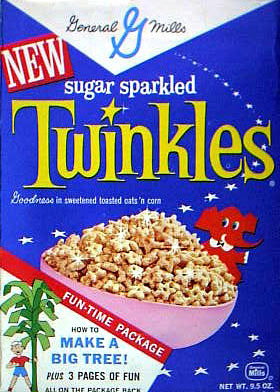 There was a book embedded on the back of the cereal box, making Twinkles the only cereal endorsed by librarians!